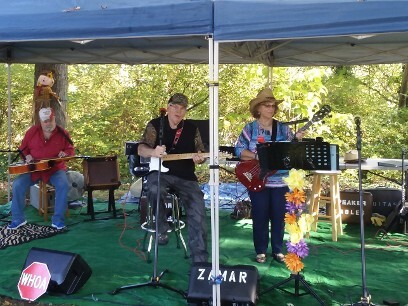 The 16th Annual Morgan’s Kitchen Fall Festival, sponsored by the St. Albans Historical Society, will be held on Saturday, October 12, 2019 from 10-4 pm at historic Morgan’s Kitchen, located along MacCorkle Ave. in St. Albans. 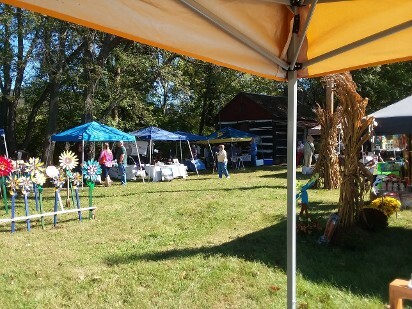 Activities include apple butter making, cabin tours, pioneer re-enactors, arts and crafts, hit-miss engines, music by the Kidd Family. 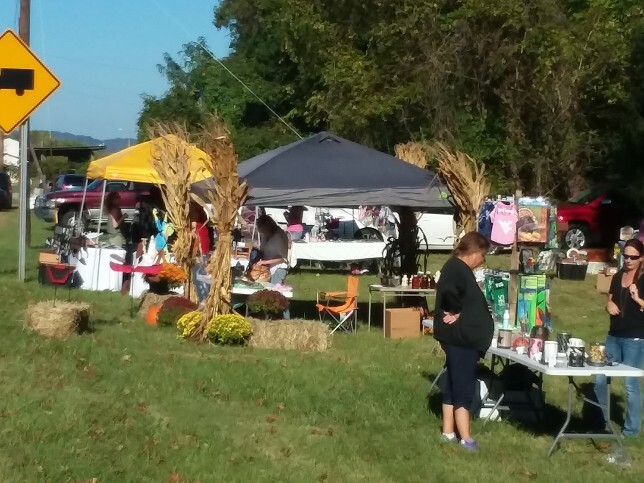 Baked goods, drinks and hot dogs will also available by the Ladies of St. Albans. Apple butter wil;l be available for purchase that day. 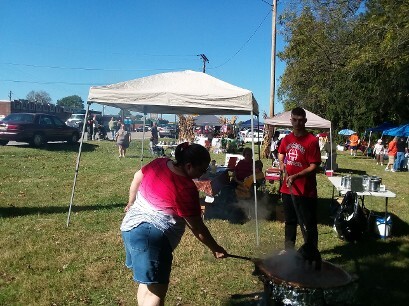 See on Facebook: "Morgan’s Kitchen Fall Festival"
Morgan Kitchen Open House - Sundays 2 to 4 p.m. 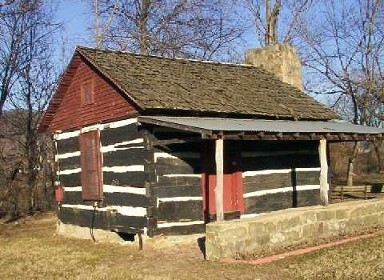 Located on MacCorkle Ave. across from Parkway Terrace, Morgan’s Kitchen is typical of log structures used during its period. It was originally located at Morgan’s Plantation near the present John Amos Electric Power Plant in nearby Putnam County. 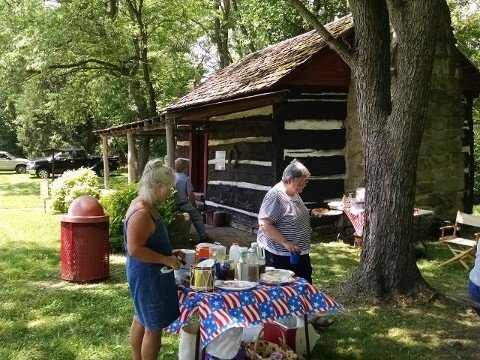 It was used to serve meals as well as serving as a hospital to the wounded Union soldiers during the Civil War at the battle of Scary Creek nearby. This log kitchen was built separate from the home in the pioneer days for several reasons. 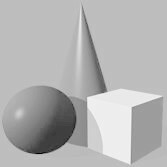 One, it had to have a continually burning fire to cook the meals, and by separating the kitchen, the house didn’t get too hot in the summertime. Another reason, if the kitchen did catch on fire, the main house perhaps would not be lost also. Morgan’s Kitchen was built in 1846 by John Morgan Jr., who at the same time, built his first home, also log. Later he built a 2-story frame home. John purchased his land from George Washington’s physician, James Craik. The Morgans were farmers and no doubt had to clear the land before building on it. The evidence of the virgin timber size can be seen in the logs in Morgan’s Kitchen. John Morgan Jr.’s youngest son, Albert Sidney (Sid) Morgan, loved hunting, taxidermy and traveling. 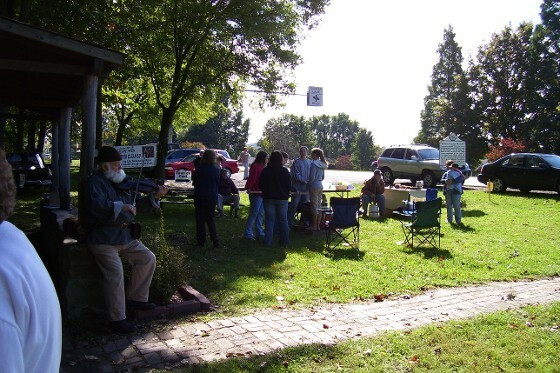 He established Morgan’s Museum which originally was located on Morgan’s farm and is now located at the State Farm Museum at Mason County Fairgrounds. 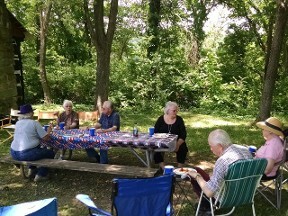 The kitchen was donated to the city of St. Albans by Sid Morgan and moved to this site in 1972, mainly by Hal Turley and his family. It was mostlythe idea of Hal Turley of St. Albans to save it from destruction due to the construction of the new John Amos electrical power plant. 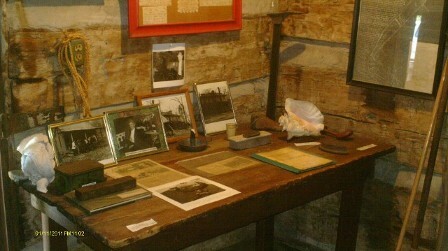 The St. Albans Historical Society was formed that year (1972) by Mr. Turley to maintain the cabin. It was partially disassembled and moved by several volunteers on a flat bed trailer. The cedar roof shingles, porch and chimney are not original and had to be replaced. 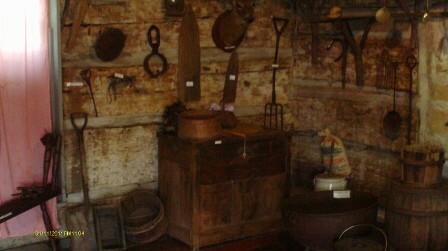 The kitchen is furnished with period cookware and utensils from that period, much from the original kitchen, as well as rustic tables, a storage chest and bed. The evidence of the hundred years of cooking is shown by the black char on the ceiling timbers. The kitchen also has a loft, which no doubt may have been used to store food supplies. Perhaps even the cook’s children may have slept or played in the loft. 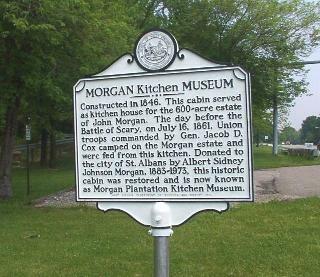 Morgan’s Kitchen today is owned by the City of St. Albans and is maintained by the St. Albans Historical Society. 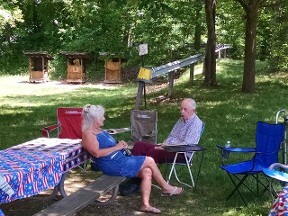 An Open House is conducted every Sunday during the summer from Memorial Day through Labor Day by the society from 2-4 pm. and a Fall Festival each 2nd Saturday in October.